The days of plastic mylar shades are pretty much over. I still remember the night as a young girl that my roller shade let loose and went flapping wildly into the night….No More. 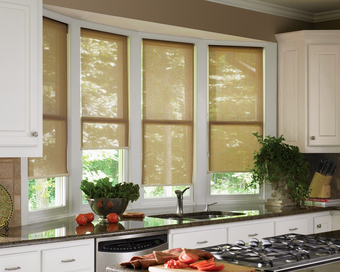 Roller shades have gone through a transformation. There are no longer springs inside a wooden pole with a pin on one end and a pawl and ratchet catch on the other. Now they simply rise by pulling on a beaded cord that runs though a clutch pulley on the end of a hollow tube. Now you can stop the shade at any level. 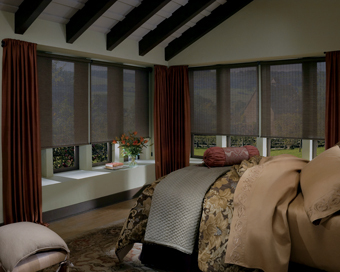 Screen shades offer protection from heat and glare on hot sunny days. Keep the shade down during the hottest time of the day and you can still see through the shade. If you have a view, this is perfect. Remember though…anything you can see through in the daytime…means that you can see in during the evening. No privacy with these shades, so plan for a secondary treatment for privacy.